In this interview with Omoleye Omoruyi, Sodiq Alabi, Communications Officer of Paradigm Initiative speaks on the Internet shutdown in Cameroon; and the role Nigeria and Nigerians can play to end such anti-people activities in Nigeria, Cameroon and indeed, the whole of Africa. Please give a brief history of the Internet shutdown and how it came about? On January 17, 2017, the Government of the Republic of Cameroon shut down Internet services in the English-speaking Northwest and Southwest regions of Cameroon. The shutdown remained in place until April 20, 2017. It was the longest internet shutdown in the world, lasting for 93 days. Its impact on the affected regions was devastating and was an unambiguous violation of the fundamental human rights of the Cameroonian people as access to internet services remains a recognised human right by several international instruments. The shutdown was essentially meant to teach the people of the regions a lesson they dared not forget. It was in direct response to the agitation in the Anglophone regions of Cameroon for a greater socio-political participation in the country and more autonomy in how the affairs of their regions were run. Instead of the government to engage the people, it chose the path of oppressive regimes and clampdown on the citizens online and also offline. 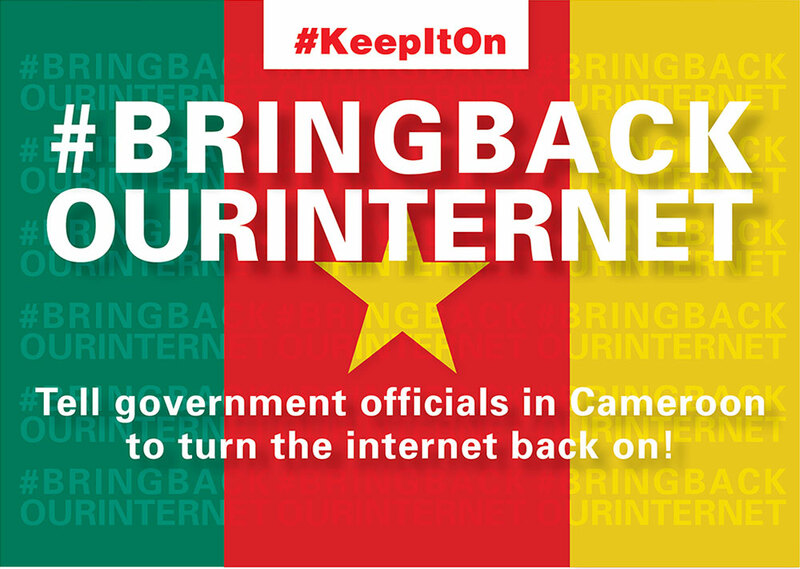 It was estimated that Cameroon lost $4.5 million as a direct result of the internet shutdown. Internet businesses crumbled, and many people-including over 200 girls in one town- lost life-changing opportunities. Paradigm Initiative’s new Digital Rights in Africa report documents these human and economic of the Internet shutdown. Since April 2017, the Internet has also been disrupted on a number of occasions, all directed at stifling public dissent. As we speak, another round of shutdown, which began in October 2017 remains in place across Anglophone Cameroon. Citizens have been reduced to travelling to other parts of Cameroon to access internet services or rely on Virtual Private Networks (VPN) or other complicated and expensive means. You already mentioned that it is restricted to the English-speaking parts of Cameroon, can you state particular reasons? The Internet shutdown or restriction has directly, at one time or the other, affected virtually all regions of Cameroon. However, the shutdown has been targeted at the English-speaking Northwest and Southwest regions of Cameroon for obvious reasons. The regions have been involved in an agitation demanding greater political participation. Activists believe that the region has been marginalised in the majorly French-speaking country. They want more autonomy for their regions. There have been few among the activists who have called for the outright independence of the regions. Now, the government believes that the best way to engage these disgruntled citizens is to deny their regions Internet, unarguably one of the most important services in the 21st century. Besides the illegality of the action, it is also criminally destructive and a clear evidence of the irrationality of the Cameroon leadership. Ironically, not only has the shutdown being incapable of stopping the agitation but it seems to have fueled it further. Perhaps, that is the objective of the Cameroon leadership all along – to piss off millions of its citizens and the international community using one stone. Are Nigerians in Cameroon affected? Nigerians are affected in two major ways. There are Nigerians who ply their trade in the affected regions or work with people in the regions and the shutdown does not discriminate based on nationality. Secondly, Nigerians at home are affected because every instance of digital rights violation in Africa has the potential to affect us. As we all know, African leaders can be good students of bad habits and as Nigeria inches close to what promises to be intriguing elections in 2019, Nigerians should not be naïve to rule out Internet shutdowns. Nigerians must be proactive and demand for government’s commitment to “no internet shutdown” as Ghanaians did in 2016. Is there any way Nigerians can stop the anti-people policies? Especially the Internet situation in Cameroon? Nigerians cannot afford to be ignorant about what is going on around us and it is crucial to ensure that a bad habit springing up in one part of Africa is fought to death immediately before other countries begin to copy it. In fact, this is why Paradigm Initiative decided last year to drop “Nigeria” from our name to expand our digital rights advocacy to other African countries. Africa is becoming better interconnected and there are shared similarities in many of the things that ail different African countries. Nigerians as the most populous people on the continent have an important role to play in bringing attention to the Internet shutdown in Cameroon and other instances of digital rights violations. Digital rights are recognised human rights and Nigerians should educate themselves about the importance of these rights. Nigerians should join the efforts to help protect their digital rights and internet freedom from governments and businesses that try to violate them. That is how we can help the people of Cameroon and ourselves in the process.